Food labels are full of lots of different kinds of information, and with a little practise you’ll be able to make sense of it all. In an age where we’re all trying to make healthier choices, being able to understand product labels is vital. Sometimes though, it can be a little tricky to actually figure out what it is that you’re buying. With portion sizes, different food groups and reference intakes to take into account, it can be hard to identify healthy choices when you’re rushing around the supermarket. Thankfully, this guide will tell you everything you need to know about making sense of food labels. So you’ll be able to go ahead and make purchases with confidence, knowing that you’re making the healthiest choices for both you and your family. The first thing that you should bear in mind when reading a food label is the portion size. Values are typically given for 100 grams of a product, and then in a separate column, for a suggested serving. For example, if you’re buying bread, there will be nutritional information for 100 grams of it, and then for one slice. By always looking at the values of one portion of a food product, you can get an idea of how much fat, sugar and salt (along with other food groups) you will be consuming in one sitting. So far, so simple! At the top of a food label you’ll find how much calories the product contains – and most of us will look at the calorific content and make a judgement solely based on that. There’s more to a healthy choice than just calories though, which is why you should always look at the other food groups on the label too. These will include fat, carbohydrate, protein, fibre and salt. Underneath fat you’ll also find the information for how much of those fats are saturates, and likewise for how much of a product’s carbohydrate content is made up of sugar. Doing some research on the different food groups and the role they play in nutrition will help you to identify what products you want to put in your basket. Finally is the reference intake column – or the recommended daily allowance. This is a rough guide to how much an average adult should be consuming. 2000 calories is usually the amount you’ll see on a nutrition label, with recommendations for carbohydrates, fat, protein and other food groups included as well. So at a glance you can see how much a serving of a product will use up of your recommended daily intake. If you need to keep an eye on how much of a particular food group you consume each day, taking a close look at this part of a label is essential. 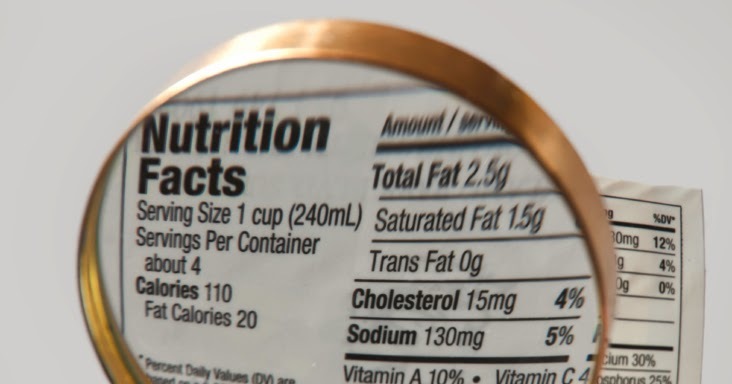 The amount of information included on a nutrition label can seem overwhelming at first. With some research and continued effort though, you’ll soon be able to decipher them at a glance. You’ll have the knowledge to make much healthier choices before too long, as well as be able to choose treats with the confidence to know how they impact on your diet. So start getting food label savvy today! Separator image Posted in Health. What Is The Best Treatment For Eczema On The Hands? When Should You Call A Chiropractor?